New tourist spot opens in Abu Dhabi and it’s free! The Founder’s Memorial, a permanent national tribute commemorating the late Sheikh Zayed bin Sultan Al Nahyan, opened to the public on Sunday (April 22). Situated on the Abu Dhabi Corniche, the memorial invites visitors to embark on a journey of discovery into the life and legacy of the UAE’s founding father. The Founder’s Memorial sites on 3.3 hectares of beautifully landscaped space which is open to the public daily. The centrepiece of the site is The Constellation, a monumental public artwork consisting of more than 1,300 geometric shapes which form a dynamic three-dimensional portrait of Sheikh Zayed. At sunset, the shapes of The Constellation are illuminated and shine like stars against the night sky, bringing the stunning portrait to life. The best time to see the illuminated artowk is 15 minutes after sundown. At the Welcome Centre, visitors can see a series of fascinating multimedia presentations exploring Sheikh Zayed’s life and values, together with rarely-seen footage, personal stories, articles and interviews with those who knew and loved him. “We are delighted to welcome the public to experience this magnificent tribute to Sheikh Zayed for the first time. 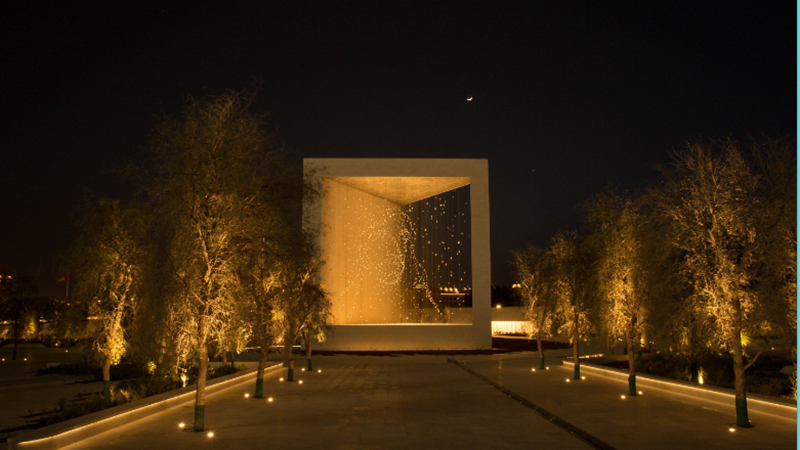 This inspiring experience allows visitors to know more about his life and values as a leader and as a human, through art, landscape, words and stories,” said Yousef Al Obaidli, General Manager of The Founder’s Memorial. Open daily from 9am to 10pm, the Welcome Centre is also the starting point for complimentary English and Arabic tours.